(TibetanReview.net, Nov04, 2014) – Buddhist nuns in Tibet should play active role in disseminating Chinese culture and work hard to safeguard national unity while also carrying forward Tibetan Buddhism, reported China’s official womenofchina.cn Nov 3. This important role of Tibetan Buddhist nuns was emphasized by Jiao Yang, Secretariat Member of the government-run All-China Women’s Federation (ACWF), as she met with a delegation of 39 of them from the Tibet Autonomous Region on Oct 30. 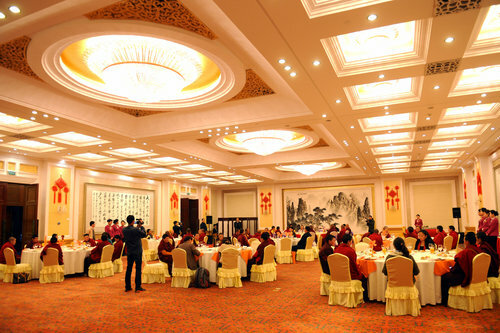 The report said the nuns were attending the 11th ACWF training course being held in Beijing. Jiao was reported to have praised the nuns for their contributions to local social security and economic development. The report said the nuns were next scheduled to continue their studies in northeast China’s Liaoning Province and then southwest China’s Sichuan Province. 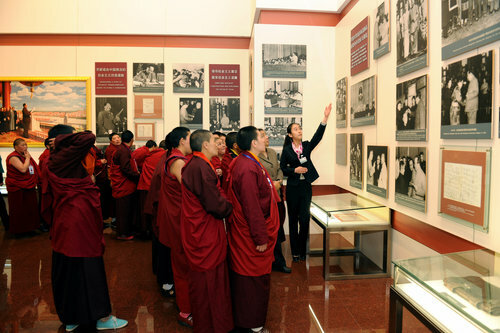 Tibetan Buddhist nuns visit the Chairman Mao Memorial Hall.